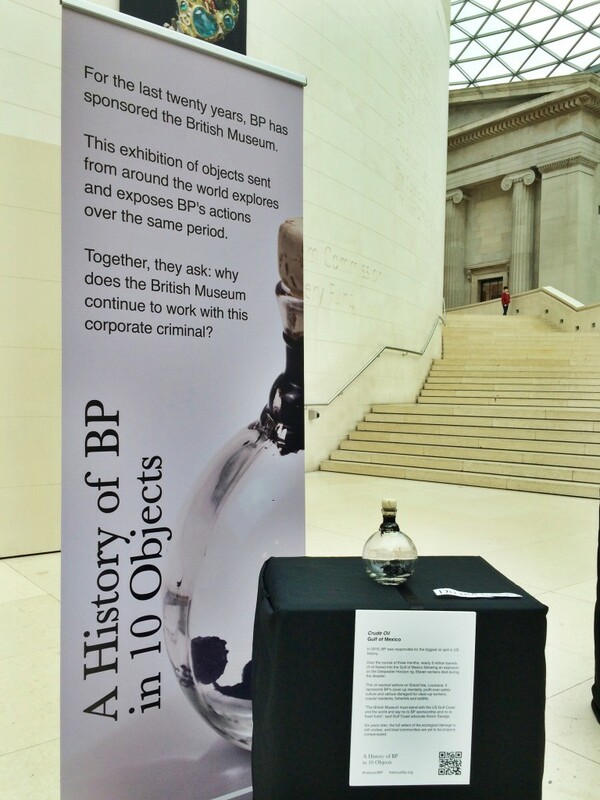 Gallery and museum workers vote to oppose oil sponsorship – BP or not BP? Posted on May 20, 2015 by BP or not BP? Something significant happened this week. In a hotel in Brighton, with a show of hands and a round of applause, a new alliance was formally sealed – an alliance that might bring the end of the fossil fuel age one step closer. This week, the Public and Commercial Sector Union (PCS) have been holding their annual conference in Brighton. On Monday, the PCS Culture Sector – the wing of the union that represents 5,000 workers in public galleries, museums and arts centres around the UK – passed a motion condemning oil sponsorship of the cultural sector, and calling for ethical funding policies for the arts. The union is now committed to campaigning for an end to oil sponsorship in the galleries and museums where its members work. The PCS has members in a number of public institutions that accept money from the oil industry, including the Tate, the British Museum, the National Gallery, the National Portrait Gallery, the Science Museum and the Natural History Museum. The motion also commits the union to joining the Art Not Oil Coalition, a group of organisations campaigning to kick oil out of the arts (that includes our theatrical action group, BP or not BP?). This matters because arts sponsorship is one of the key methods used by the fossil fuel industry to prop up its power. By throwing a small amount of money at public museums, galleries and theatres, BP and Shell are using our cultural institutions as a form of cheap PR. These oil giants supply less than 1% of the annual income of organisations like the Tate and the British Museum and yet receive a large amount of high-profile branding in return, allowing them to present themselves as respectable and necessary pillars of society rather than the climate-trashing rogue corporations they really are. To avoid the scariest climate change scenarios, we need to reduce the influence of oil, gas and coal companies on our politics and public debate – and ending fossil fuel funding of the arts would be a significant step in the right direction. The campaign to kick oil out of the arts has been building momentum over the last few years, with more and larger actions taking place, new groups being formed and significant victories at the Royal Shakespeare Company and the Southbank Centre. The decision by gallery and museum workers themselves to join the fight could be another crucial turning point. The union’s decision to formally oppose oil funding didn’t happen out of the blue. Over the last year, we’ve been building a relationship together, finding common ground and seeking ways to support each other’s struggles. 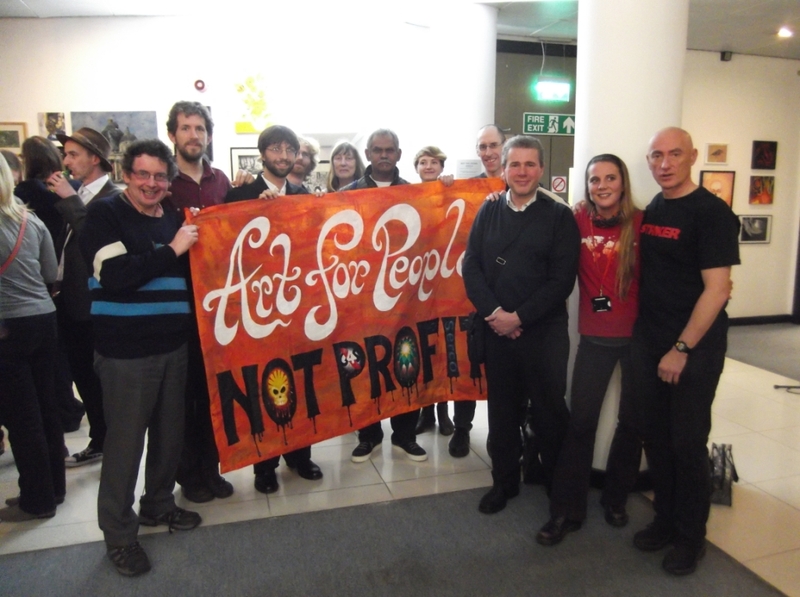 Last October, we disrupted the press launch of the Shell-sponsored Rembrandt exhibition at the National Gallery with an anti-oil musical performance that also highlighted the gallery’s sweeping plans to privatise two thirds of staff jobs. Since then, Art Not Oil groups have joined picket lines and protests in solidarity with workers as the PCS’s dispute with the National Gallery has escalated. This is how we’re going to win – by uniting our struggles and finding ways to work together, even when the alliances seem a little unlikely. Next time we invade a BP-sponsored gallery for an anti-oil performance, the security guards who remove us might well be members of a union that formally supports our cause. The following week, you might find us at a rally demanding that those guards be paid fairly for the time spent escorting us out. If we can build this kind of solidarity into all of our campaigning, then there’s really no limit to what we might achieve. 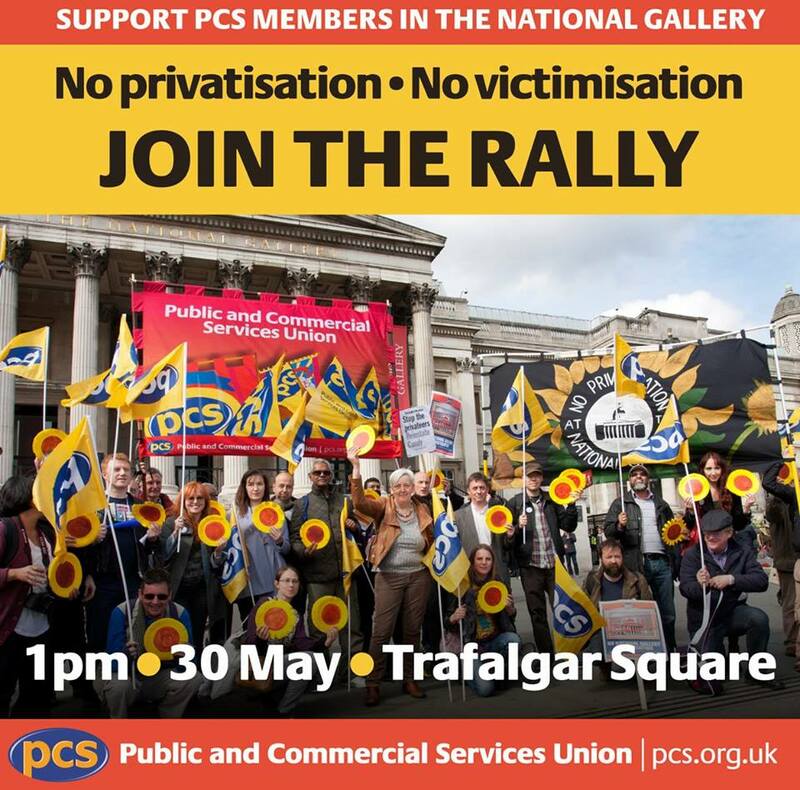 From the 29th May to 1st June, many members of our group will be at the Reclaim the Power camp at Didcot, but on Saturday May 30th we’ll take a day trip away from camp to join the Trafalgar Square PCS protest against Candy’s sacking at 1pm. We hope you’ll join us at both these events, and continue to strengthen the essential links between our connected causes. No to oil sponsorship and privatisation! Reinstate Candy Udwin! See you on the streets, and in the galleries and museums! This conference agrees that corporate sponsorship by or procurement from dirty oil companies, blacklisting companies and arms traders has no place in public museums and galleries. • The Tate received £3.8m as part of its sponsorship deal over a 17 year period, representing an average donation of £224,000 a year, and accounting for 0.5% of Tate’s budget. This amount is actually highlighted as “insignificant” by campaign groups Art Not Oil and Platform compared to Tate’s budget and show that it is not needed to sustain the galleries. • The National Gallery receives sponsorship from Shell, most recently for its Rembrandt exhibition which was entirely staffed by a private security company CIS, and at a time when privatisation plans were mounted. • The British Museum is not only sponsored by BP, but also uses the blacklisting company Carillion as a subcontractor for its facility management. • National Museums Liverpool is using private security company G4S despite their horrendous human rights track record and the fact they are currently under investigation on criminal charges. • Congratulates the PCS Culture Sector for starting to link up with organisations like Art not Oil, a coalition of campaigners who tackle oil sponsorship in the art and culture sector through creative intervention and agrees to become a member of Art not Oil (free) and encourages branches to make donations. • Instructs the PCS Culture Sector Executive Committee to work with Platform – an organisation that combines art, activism, education and research to create unique projects driven by the need for social and ecological justice – to develop a model Ethical Policy for Museums and Galleries that will include sections on sponsorships, public procurement and minimum standards for the workforce. • To lobby the Museum Association, SJAM and managements of PCS Culture Sector branches (in key institutions) to adopt the principles of this Ethical Policy, in particular on staff conditions and oil and arms trades sponsorships. • To support the campaign to end the BP Sponsorship in Tate and the British Museum, support blacklisted workers campaigns against Carillion and other blacklisting companies and lobby to end any security contracts with G4S in museums. Fantastic news! Congratulations to the PCS on their resolution, and to all concerned. Let’s get our culture back and be able to again be unreservedly proud of the arts and all that they stand for (and against).